Loud and ferocious, the Gretsch G5191BK Tim Armstrong Electromatic Hollow Body bears the personal stamp of Rancid founder and punk godfather Armstrong. Huge tone resonates from deep within its bound single-cutaway hollow body, which features parallel tone bar bracing with sound post and bound F Holes. The one-piece maple neck has a white graphite nut and bound rosewood fingerboard with acrylic block inlays. 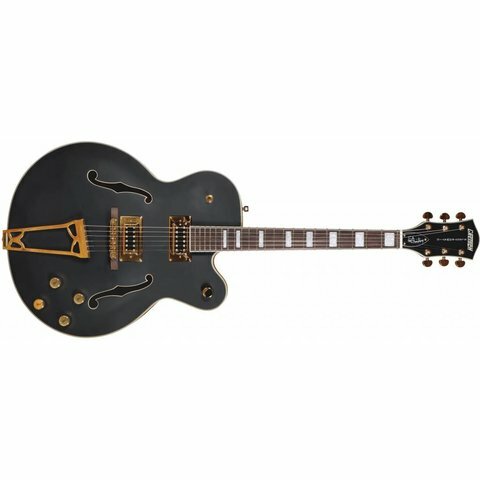 Other features include dual "Black Top" Filter'Tron humbucking pickups with gold-plated bezels, three-position pickup switch, gold-plated hardware, bound headstock with pearloid Gretsch inlay and Armstrong's signature on the truss rod cover, Grover tuners, Adjusto-Matic bridge and harp tailpiece. Left-handed model also available.